TechRadar spoke to the folks at Toshiba today and they revealed a number of key changes that may happen to the Cell TV when it eventually comes to the UK. While the company was cagey about giving too much away, there were some things it mentioned which could well make it to the UK market. Olivier Van Wynendaele, Assistant General Manager, Marketing Europe at Toshiba announced that the panel used for the UK will have a 9,000,000:1 contrast ratio and will come with a Kira 2 LED panel. Inside the beast of a black box, which makes up the power part of the Cell TV system, should be a 3TB drive and the LED technology involved will house 512 local dimming zones. Wynendaele also noted that: "There will be some trade-off to do" when the system hits the UK, and said this could centre around the amount of tuners the Cell TV will have in the UK. 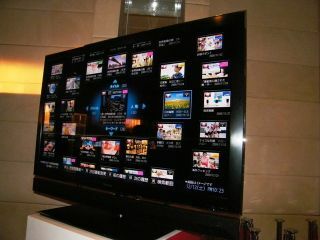 Although there are eight HD tuners inside the Cell TV system which is out in Japan at the moment, this is all to do with the country's eight terrestrial HD channels. As the UK has significantly less with Freeview HD, we should see the amount of tuners on the system cut to four. That's still four tuners constantly piping into a system which is continuously recording the footage so you can pause at your pleasure and watch the feeds at the same time, so the trade-off isn't that significant. UK-wise we should also see the 2D to 3D conversion technology which was first shown off at CES 2010 and the TV will be 3D-ready. Another feature which the UK may get is the addition of a Blu-ray drive within the black box. "It makes sense to have this," explained Wynendaele. Perhaps the most interesting news, however, is that the UK may well get a significantly smaller black box – fingers crossed – or even a Cell TV completely without a box. "We will do what we can to get the Cell technology into the TV," Wynendaele noted. Unfortunately there's still no word on pricing or UK release date. As the rest of the TVs announced by Toshiba will be out in the market in May, TechRadar believes that these announcements will be made at IFA 2010. If this is the case, then the Cell TV may well have the longest teaser campaign for a TV ever. Here's hoping it's worth it.